The Senegal Parrots are striking birds that are both cuddly and affectionate. It is a gregarious species, continuously chattering with a range of whistling and squawking calls. The Senegal Parrots possess bright yellow eyes, gray head, with patches of green all over. They have a relatively large head and beak for their overall size, and feathers form a short broad tail. Adults have a charcoal gray head, gray beak, bright yellow irises, green back and throat, and yellow underparts and rump. The yellow and green areas on a The Senegal Parrot's front form a V-shape resembling a yellow vest worn over green. Juveniles have dark gray, almost black, irises. Males are generally, but not always, larger and heavier than female birds. If your Parrot has become too noisy or disobedient or aggressive, our Parrot Training Course will teach you how to train it and stop it from screaming and biting. 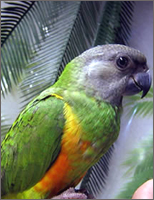 The Senegal Parrots got its name from its place of origin that is Gambia, Guinea-Bissau and Guinea. These birds make lovely pets. Its natural habitat is open moist woodland and savannah. The Senegal Parrots are beautiful cuddly birds are considered quiet by most people's standards. Many Senegal Parrots learn to speak some and most will imitate noises. 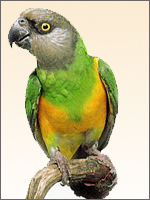 They are much like Conures in having a playful personality that requires lots of toys for playing, attacking and chewing so that they don't get bored. The Senegal parrot learns to talk and imitate sounds such as the creak of the garage door and the ring of the telephone. The Senegal Parrots are active and amusing. Exercise and regular time out of the cage keeps them fit and healthy. These Parrots can learn and mimic words and sounds quite well. 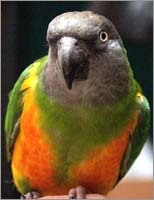 Repeated interaction with the Parrot would relax it and make it friendlier with the owner. Their calls are generally high pitched whistles and squawks, but they are not as noisy as many other parrot species. As pets, the Senegal Parrots are quiet but with time they learn to imitate both noises and speech. They love to play and crave to be out of their cage from time to time. Some of these birds as pets may resort to biting when they are upset or frustrated. Senegal Parrots are generally one-person birds, and are usually very affectionate and love to cuddle. Free Online Seminars on Training Your Parrot: Join our training experts on one of our FREE online seminars and learn how to train and take care of your Parrot correctly. Our Free seminars are held periodically. And since the seminars are presented online, you don't need to go anywhere to attend them - you can join them sitting in the comfort of your own home! All that you need to do to join the next free online seminar is to sign up here so that we can notify you when the next one is held. When you subscribe to our FREE online seminars and email course on Parrot, you will discover the natural instincts of your Parrot and learn about Parrot training, diet and care - FREE! !